"Please enjoy these truffles from Penrith," says a suited waiter presenting crimson-pink Black Onyx beef tenderloin under a canopy of kalettes, fragrant perigords and morel jus. Penrith truffles, hang on, what? "Just kidding, they're from Manjimup in Western Australia." Aha. After almost 30 years, Tetsuya Wakuda's benchmark restaurant is a place of warm humour, linen tablecloths and straight-edge Japanese cooking threaded with French technique. In a time before Attica, Brae, Sepia and Quay, it was Tetsuya's attracting the global food community's attention. In 2018 the restaurant is possibly experienced by more tourists than locals, at bit like the BridgeClimb or that wildlife park in Darling Harbour. Tetsuya's is way more appealing than an atrium of sad koalas, though. The 1988 edition of The Sydney Morning Herald Good Food Guide mentions a strange but exciting "kind of nouvelle cuisine" that was appearing at a new place called Ultimo's. "It comes as no surprise," said the Guide, "that the cook is in fact Japanese." That unnamed chef was Wakuda, who had been absorbing everything Sydney had to offer since arriving in the Harbour City from Japan in 1982. 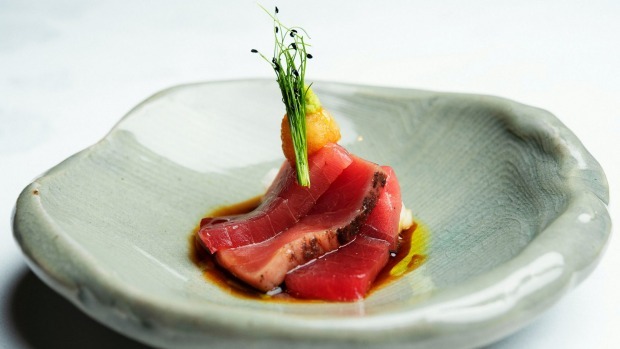 Tony Bilson had just opened Kinselas at an old funeral parlour in Darlinghurst and Wakuda found himself making sushi for the new restaurant and nightclub. (He had spent four years in the kitchen of the New Otani Hotel in Tokyo). Bilson showed Wakuda a thing or two about classical French technique and the legend was born. Ultimo's opened near the Powerhouse Museum in 1987 but after two years successful years Wakuda and his business partner split. The eponymous Tetsuya's opened in Rozelle in 1989 and the signature confit ocean trout, which Wakuda thought to gently cook in olive oil to retain its shape and brilliant colour, debuted three years later and sent shockwaves through Sydney's food set. 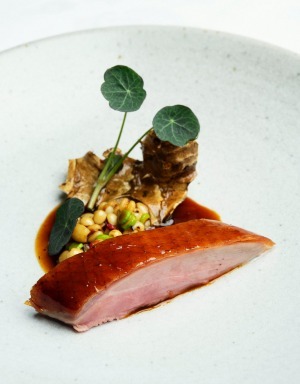 "Modern Australian" cooking has moved on since 1992, of course, but that trout is still a damn fine dish, currently served over a little thicket of apple and punching with the full savoury force of dried kombu and soy. 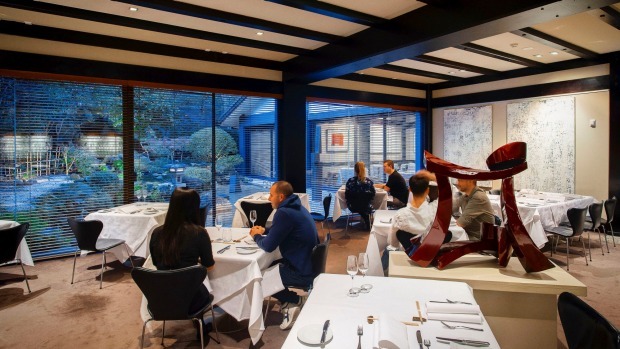 Tetsuya's relocated to its heritage-listed Kent Street site in 2000 and the trout came too. It'll probably never leave. 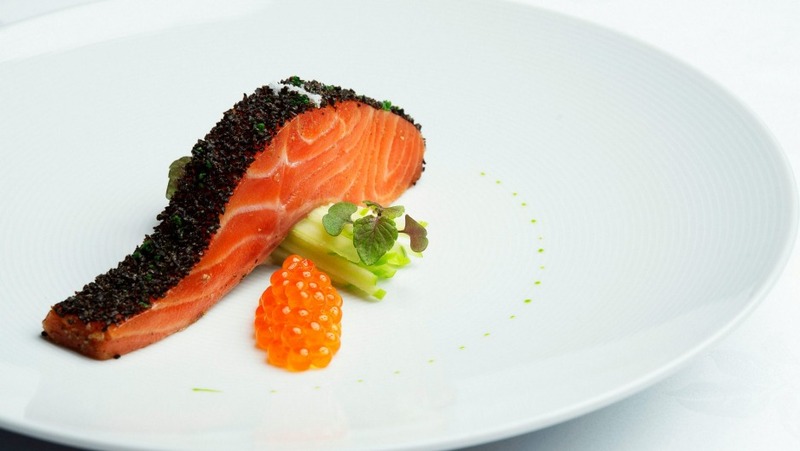 Many hyper-talented chefs have been charged with plating the famous dish at some point and many have gone on to lead terrific kitchens of their own. Name check Martin Benn (Sepia), Luke Powell (LP's Quality Meats) and Darren Robertson (Three Blue Ducks, Rocker). Englishman Josh Raine (ex-Urbane, Brisbane) is now running the Tetsuya's brigade, replacing Kevin Mok who left December. The current tasting menu weighs in at $230 a head and starts with a steamed spanner crab tian laced with sea urchin cream and balanced by a crown of avruga, followed by tuna sashimi beautifully dressed with soy and mirin. Duck breast is the highlight with deep and clean flavours after being cured with orange, cinnamon and star anise salt and maintained in master stock for a week. It's roasted in an ultra hot oven so the skin becomes like glass and served with jus made from duck necks, Davidson plum and umeboshi, the salted and sun-dried hard "plum" of Japan that actually belongs to the apricot family. When I was here three years ago, the floor team were dreary, robotic old bunch. Swerve off script and ask a question about the restaurant's high-end investment paintings (only Lucio's gives Tets' a run for its money in the restaurant art game), or how many bottles of Domaine de la Romanee-Conti they were shifting at $14,500 a pop, and the waiters would flip out with nerves. Now they're cracking truffle jokes and getting excited by a juicy 2011 Bongiraud Obecanje gamay from Serbia ($25 by the glass). There's no background music but views to the Japanese garden provide all the relaxing vibes you need. Best double-down on your comfort level with another helping of malt bread and a black truffle butter that's definitely not from western Sydney either. If you haven't visited Tetsuya's for a few years or never at all, best book in for Saturday lunch and enjoy the slow ride. It's a lot of fun being a tourist in your own town. Famous diners Margaret Fulton, John Olsen, pretty much any celebrity visiting Sydney between 1998 and 2005.